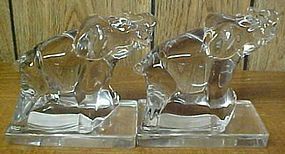 These pretty crystal clear Elephant Book Ends measure 5 1/2 inches high x 6 1/2 inches wide were made by New Martinsville Glass. Both Book Ends are in very good condition, however, there is a sliver of glass off the right side base of the one elephant, there are no other chips or cracks. We guarantee all items to be as described. Feel free to email with any questions. THANK YOU.